If you ever feel like you’re just wasting time on social media sites, here’s some good news, it could end up saving you money. Thanks to programs like American Express Sync and Klout Perks now some of the time you’ve spent online might start to pay off with savings in the real world. I’ve been taking advantage of some of this social currency for a while and thought I’d share some examples with you. The savings through Klout Perks require you to have an established social network but the ones from American Express can work for card members who have a brand new profile on Twitter or Facebook so I’ll start there. Last year American Express started rolling out couponless offers from merchants that you can load onto your card from social media sites like Facebook and Foursquare. I didn’t take advantage of them but just a few weeks ago they added Twitter so I went ahead and registered my Blue Cash card to try it out. Whether you’re using Facebook or Twitter, the process of syncing your card with your social media account is similar. You register your card on a page on the American Express site with your name, email address, and credit card number. You can sign the same card up for deals on both Facebook and Twitter. As I’ll show you in a second, there are deals on Facebook that I haven’t seen on Twitter so it may be worth signing up for both. The Facebook deals come through a Facebook app called “Link Like Love”. The list of offers you see on Facebook are supposed to be based on your likes and interests on the site. Here’s an example of one I found and signed up for, “Get $5 Back When You Spend $5 Or More”. I’ve written about Redbox online movie rental before and probably shared it on Facebook so it makes sense why the offer would show up. 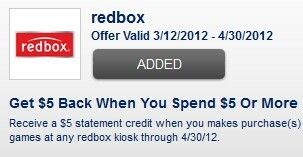 It’s hard to argue with an offer that gives you $5 back when you spend $5. Now that the deal has been added to my card, the way it’s supposed to work is that I get the statement credit a few days after I spend the money. That’s how all of the American Express couponless offers through social media are setup to work – you start by opting in to a deal. It’s added to your card and if you meet the criteria before the deal expires then your savings show up as a credit on your statement. The offers on Twitter are available via the favorites on the American Express Twitter page. They seem to be more universal than Facebook, looks like the same ones show up for everybody. Instead of adding them from the list like you do on Facebook, the Twitter offers each have their own unique hashtag that you have to include in order to register for the deal. For example, I signed up for an offer “Get $5 back on next $5 in store purchase at McDonalds” by tweeting and including the hashtag #AmexMcDonalds . Here’s the response I got back to confirm that I was registered for the offer. I don’t typically eat at McDonalds but will probably end up in one at some point during my upcoming travels. I didn’t see any harm in adding an offer to my card that I potentially might not use. It doesn’t cost anything and if I don’t use the offer then it simply expires. Of course, anytime you have to enter your credit card number online one of the first things you think about is security. If you’re an American Express card member and decide to try out these offers, I’d go directly to the americanexpress.com website and sign up. You’ll probably be getting emails inviting you to sync your card with Facebook or Twitter but I would be careful about clicking on a link in an email and entering your credit card number on the webpage you land on. It seems to me there’s a potential for someone stealing your credit card number via a fake email through a phishing scam. So just to be safe, sign up directly on the AmEx site and not through any email in your inbox. Sounds reasonable to me, they don’t pass my personal info onto the social networks which is what I was looking to confirm. The next category of social currency is based on how much and what type of influence you have online. A company named Klout came up with a way to calculate how influential you are. They call the result of the calculation your Klout score and it “measures influence based on your ability to drive action”. The Klout Score uses data from social networks like Facebook, Twitter, LinkedIn to measure how many people you influence, how much you influence them, and the influence of your network. So why would you care about your Klout score? They’ve also introduced a feature called Klout Perks that offer a variety of promotions if your Klout score is high enough. The criteria are different for each offer, sometimes it will also be restricted by your location and the topics you’re influential about. As you can see from some of the people in my network Klout tracks which topics you have the most influence on. Offers are sometimes restricted by your area of expertise but not always. It’s kind of hit or miss. There have been some perks I’ve been ineligible for that I wanted to take part in. There have also been perks I qualified for that I wasn’t interested in. Mostly, I’ve been interested in offers that saved me money – and most of those weren’t related to my main topics of personal finance, money, and finance. The very first offer I took part in was a really cool set of free business cards from Moo cards. I was going to the Financial Blogger Conference last Fall and needed business cards but didn’t want to spend a bunch of money on them. That’s something else I should point out about social currency and deals, I only take advantage of them when it’s something I would be spending money on regardless of the offer. Another good example is the Klout perk I took advantage of from ScoreBig (the Priceline of event tickets). We were going to a baseball game with a group right when the perk showed up. As you can see from the Tweet above, they gave me a $25 credit to use towards the tickets and helped me buy them for half face value. Over the last year companies like American Express and Klout have rolled out tools that let the average person save some money using their social media profiles. There were certainly ways to do it before but not using methods so simple you could explain them to your grandma. You’re certainly not going to get rich off of social currency but it’s definitely possible to save some money. The examples I shared here are just the ones I’m familiar with and have used myself. I’m sure there are other ways to save or make money using social media, please share them below. I think there were a lot of us bloggers taking advantage of that Klout free Moo card offer for FINCON last year. 🙂 I’ve still got enough left over to use next year! I got the $3 off $25 shell. Amex wants to keep your Amex in your wallet and use it for other purchases. They are hoping you will keep it there and not use a different card. My wallet holds three and Amex sync is one of them. I’ve only just started using the FourSquare check-in deals, though I do not have an American Express card. There are still some places that offer deals without the card, but it seems like the deals for the card are significant and widespread. Klout perks have not done much for me yet, but I’m keeping an eye out for something I like and can put to good use. Great tips about saving with social media promotions. I also like the AmEx social deals that link to foursquare. I’ve saved about $20 at restaurants by checking in on foursquare and then paying with my American Express card. Klout also had a promotion with Capital One for awhile that increased cash back rewards based on your Klout score. So true that these won’t make you rich, but it’s nice to get an occasional free meal with them. I’ve used that Klout Moo Cards offer as well (also for FINCON). I’ve gotten a couple of other offers. I’ve seen the Amex twitter deals as well. I just might have to sign my card up. Thanks for pointing out the security.